When it comes to commercial finance, there are quite a few options. Gone are the days when firms had no choice but to get a business loan from a bank or building society. Now there are several alternative ways for firms to raise much-needed cash. Below we consider the most accessible options. 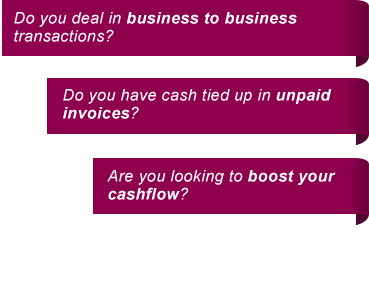 Invoice factoring allows firms to borrow money against their outstanding invoices. If a firm is owed £800 by one of their customers they can borrow up to 90% against it – in this example, £720. Once the customer pays the invoice, the loan is paid back along with the fee for the loan. The process is extremely simple. It is a way of borrowing money that is suitable for most firms to use. To ensure that the invoice is paid in a timely fashion the factoring firm will normally want to play a role in credit control. This means if a customer does not pay that invoice on time, they will speak to them about it and take the necessary action to get the invoice paid. How much can be lent varies from invoice to invoice. It is partly dependant on the credit worthiness of the customer who owes the money. The financial viability of the company who wants to borrow the money is also taken into account. However, a company having a poor credit rating is not an automatic barrier to invoice factoring. The best commercial finance companies are flexible. They will come up with a solution for practically any situation. Invoice discounting works in the same way as invoice factoring. However, it allows firms to retain control of their own credit control. The amount firms can borrow is slightly lower at up to 85%. There are no credit checks involved, so a loan is unlikely to be refused due to the company who owes the money not having a good credit history. Firms who want to use invoice discounting rather than invoice factoring need to prove they have a good track record when it comes to collecting debts. When people think about borrowing against assets they automatically think of borrowing money against property using a mortgage. However, many firms have other assets held within their businesses that they can also borrow money against. Trade finance allows firms to borrow the deposit they may need to secure a large order. Some firms will not order goods off a company unless a firm can prove that they can afford to pay for the raw materials, export duty and shipping costs. This kind of financing can help firms to secure large lucrative orders. Supplier finance allows firms to buy raw materials using finance from a third party. Most machinery and plant is worth a significant amount of money. Firms can borrow money against the value of these assets. The best commercial finance companies offer a range of ways for firms to raise money. The best firms offer sector specific financing solutions such as construction finance. They can also help firms to manage their outgoings – for example, by paying tax bills gradually rather than all at once using the HMRC’s Time to Pay scheme.